A bottle of wine dressed up in a festive bag is the usual accessory when invited to a holiday gathering. But it’s fun to mix it up. With available time for most folks in such short supply, gifts from the kitchen are becoming a rare gem. 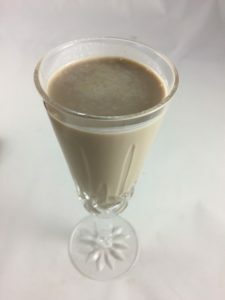 This gift idea is almost as simple as purchasing a bottle: make a riff on Bailey’s Irish Cream–the one perenially stocked in the liquor department. 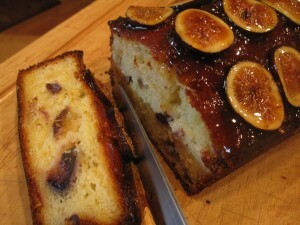 Something demanding more time, but a simple recipe all the same, is Yogurt and Fig Cake. (Featured in the recipe below.) A friend and incredible pastry chef, Anna Marie Ascher, once told me that the perfect cake is one you would enjoy eating for breakfast. This certainly meets that criteria. I might add that the perfect cake for gifts is the size of a loaf pan and easily portable. When cool, wrap the cake in brown parchment paper (so that the topping doesn’t stick), tie with a bit of twine and stick a sprig of holly between the string and paper. Voila! I can savor this cake for a good two weeks, if tightly wrapped and refrigerated. Try serving with a dollop of freshly whipped cream enhanced with a liqueur, such as Grand Marnier to complement the orange zest. It also freezes well up to a couple of months, ready to thaw when the occasion demands. Or step it up yet another notch and make your own chocolate truffles. Take a look at the recipes–they really aren’t as hard as you’d think. Craft shops carry small boxes that are perfect for these morsals. 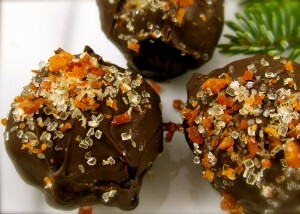 Here are the links: Chocolate Truffles, and, a bit more savory , Chocolate Truffles with Bacon. 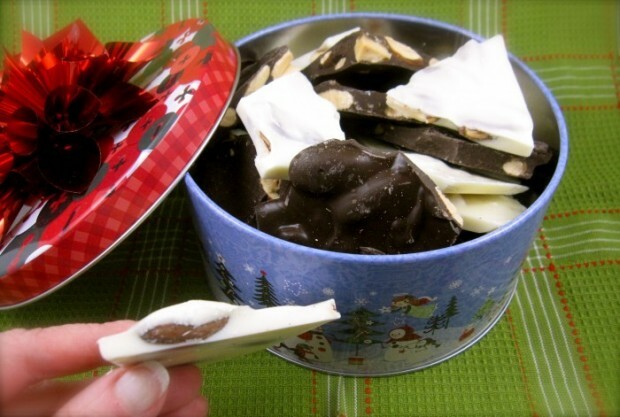 Vicki’s Famous White and Dark Chocolate Bark (the feature picture) and Vicki’s Old-Fashioned Peanut Brittle are other ideas. 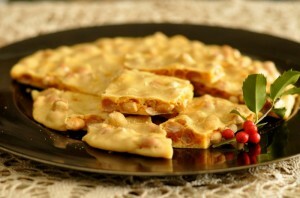 The reasonably simple recipes are tailor-made for packing in tins and distributing amongst office mates. Position rack in center of oven and preheat oven to 350˚. Generously butter metal loaf pan (apx. 9X5X3-inches). Sift flour, baking powder, and salt into a medium bowl. Combine yogurt, sugar, eggs, orange zest and vanilla in large bowl; whisk until well-blended. Gradually whisk in dry ingredients. Using rubber spatula, fold in oil. Transfer batter to prepared pan and place pan on baking sheet. Place baking sheet in oven and bake until cake begins to pull away from sides of pan and tester inserted into center comes out clean, about 40-50 minutes. Cool cake in an on rack 5 minutes. Cut around pan sides to loosen cake. Turn cake out onto rack. Turn cake upright on rack and cool completely. Stir fig preserves and 1 teaspoon water in small saucepan over medium heat. Brush 1/2 of hot preserves over cake. Arrange sliced figs on top of cake. Dollop remaining glaze over figs. Let cake cool and set.